While it sounds like a lot of different problems, none of these are the root problem. Your problems exist because you can’t create “opportunities.” If you’re not having conversations with your prospects daily, you’ll never have the opportunities you need to grow your business. Now, let’s talk about what you can’t do without. First things first, you need a client acquisition system. This system has many purposes, but ultimately, its responsibility is to bring you new clients daily. You can’t do without it and I know most of you don’t have this in your business. I want you to think about your ideal client. You have a master skill that helps them get a specific result. (You do have to be a true expert if you want this to work). Now, your ideal client has a major pain, problem or desire, know what it is will be vital to building the perfect client acquisition system. Let me use myself as an example, my client’s major pain point is not getting enough clients. Due to this, anything that’s focused around helping them solve this problem is attractive to them. It’s a pain point in their life and I’m offering them a solution to this major pain/problem. Following me? Your client acquisition system will focus on the same topic, expect it will be built around the major problem/pain or desire your ideal clients have. Simple, right? Get it built! Personally, I love webinars and videos. Both of these build a relationship with your prospects. I get my ideal clients signed up and I give them value. I help them get results and by doing so, they become invested in what I do and view me as an authority. You need to do the same for your prospects. Most importantly, a client acquisition system is going to bring you more new clients, help you impact more people, help you make more money and give you the freedom you’ve been searching for. You now know just how important it is. Let’s review what we just discussed because I want you to have complete clarity. You need to build your client acquisition system. The topic must focus on a major pain, problem or desire. Once they enter, you must automate the conversation. Your goal is to push them further through the funnel until they become a client. Lastly, I want to help you get started filling your client acquisition system. First, you must know exactly who your ideal client is. You have to know them on a personal level, know them like you know mom. It’s true, that’s the only way you’re going to be able to build a message that motivates them to take action. Once you know who they are, you can find them by sharing your message. Personally, I love Facebook because my target clients are there. For most of you, you’ll be able to find your target clients there too. Social media is often a great place to start attracting your ideal clients. Let me leave you with a few more tips because I really want to help you get results. 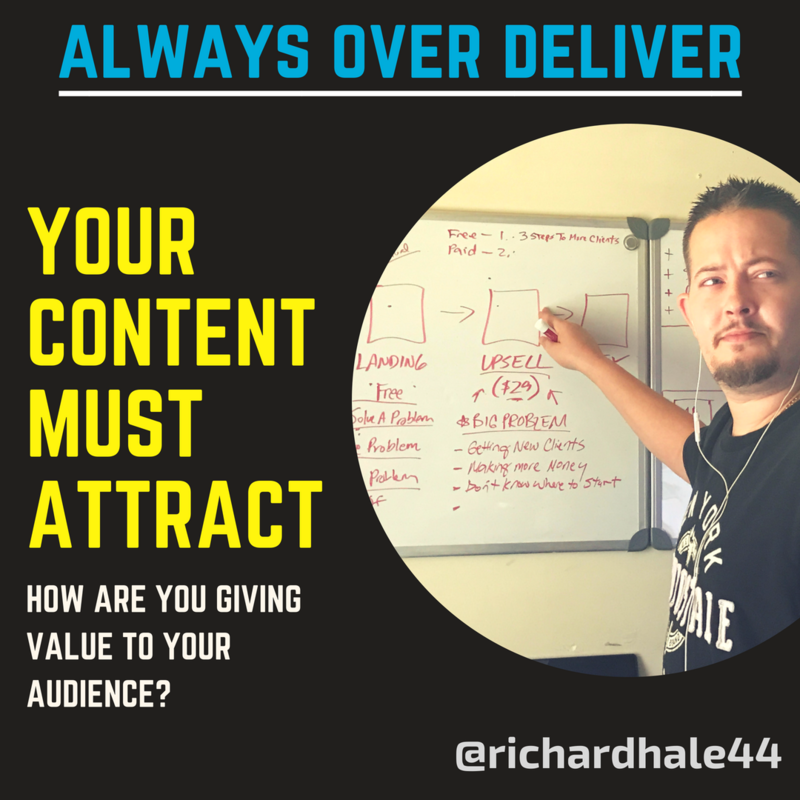 Make sure your content focuses on the problems, pains and desires they have. Make sure you’re being 100 percent yourself and sharing your story. Make sure you’re giving value, always give value! Make sure you document everything and test which content does best. Build authentic relationships, you can’t grow your business alone. You need to build a community of loyal fans that will help you through this journey. Be consistent. Make sure you’re creating content daily and don’t stop. Leverage live video, it’s the best content type you can use. After years of being a business coach, I’ve learned a lot and I’ve made a lot of mistakes too. I can promise you right now, if you follow this advice, you’re going to see better results. I know this is just a start, but it’s vital you have this foundation in your business. If you have any questions, feel free to ask. Richard Hale is the Founder of TeachingOnlineBusiness.com, a platform dedicated to helping coaches, consultants and experts grow their client business. We help client business owners build high ticket offers, dial in their messaging and help the build leverage with systems to hit their business goals.